“I hold out no hope of mercy for you on earth!!!" It's probably not the kind of sentence you expect to find while exploring historic records on Findmypast. But then, the NSW Gaol Photographic Description Books 1871-1969 isn't your typical family history resource. Spanning nearly a century's worth of crimes and misdemeanours, committed by tens of thousands of prisoners from 14 gaols around New South Wales – from Darlinghurst to Broken Hill – these records paint a colourful and detailed picture of crime and justice. Most excitingly for family historians, they include not only transcripts but original images – which themselves contain mug shot photographs of the prisoner in question, hence the title of the records. It may even be enough to make you wish your own 19th-century or even, dare we say, 20th-century New South Wales ancestors served a stint or two behind bars. To take an infamous case study, the NSW Gaol Photographic Description Books 1871-1969 record set provides a surprisingly personal glimpse into the case of convicted murderer Louisa Collins. As the record described, Louisa was born in 1849 in Scone, New South Wales. Her mug shot – taken on 28 July 1888, as is duly noted – portrays an understandably solemn-faced woman, with black hair and brown eyes (also duly noted). Her crime? The “murder of Michl. [Michael] P Collins". What the record doesn't share is that this man was her second husband, and that his autopsy showed traces of arsenic poisoning. Nor does it mention that her (late) first husband – who'd died just months before she married Michael – displayed similar symptoms before his own untimely demise. 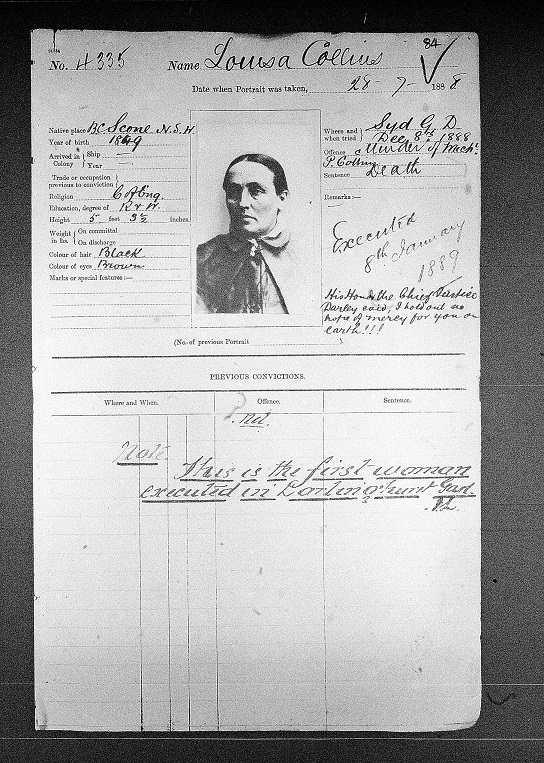 Tried on 8 December 1888, her sentence was as ominous as it was short: “Death." Here's where the record gets really interesting, however. The clerk or clerks who noted down these details – and there certainly does seem to be the handwriting of at least two, possibly three, different hands scrawled across the document – also jotted down information that was perhaps less bureaucratically necessary, yet all the more fascinating. “Executed 8th January 1889," noted one commentator, in slightly faded handwriting. So far, so good – you can see why this was necessary to record. “His Honor [sic] the Chief Justice Darley said, I hold out no hope of mercy for you on earth!!!" added another. The copious exclamation marks underscore the dramatic tone; it's almost as if whomever wrote this can't quite believe it. You can almost hear the judge's scornful cry. "Note. This is the first woman executed in Darlinghurst Gaol." This final remark, in a visibly different hand, is underlined. Whether these anonymous commentators were titillated by the controversy of a woman being hanged, or their proximity to such a famous case, remains unclear. But their scrawled notes really illustrate how these records can capture not only the hard and dry facts of our ancestors' lives but also the more personal, emotive and colourful aspects. Perhaps they were aware of the historic nature of the execution, since it was a rare event for a woman to suffer such a fate. But however infamous she may have been in her final days, and whatever their reasoning was for jotting down these comments for posterity, they certainly can't have known that Louisa Collins would become the last woman to be hanged in New South Wales. Even if your ancestors weren't as infamous as Louisa Collins, the NSW Gaol Photographic Description Books 1871-1969 are well worth investigating. If you're fortunate enough that your ancestor was unfortunate enough to have appeared amongst the photographic description books, a potential wealth of information awaits you. Many records describe in detail distinguishing marks and tattoos; some even list mannerisms such as nail-biting. 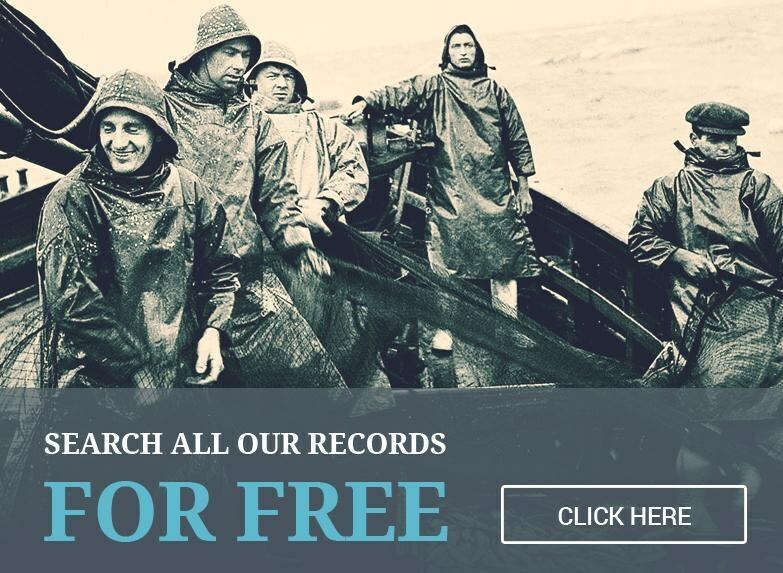 These records could unearth a fascinating snapshot of your ancestor's life and times – not to mention their (potentially guilt-ridden) face!